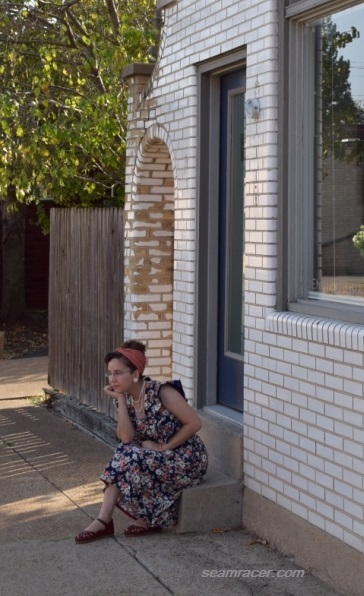 Several months ago when Mena Trott (of Sew Weekly fame) and I were brainstorming the Sew-along on Instagram called the “Summer of the Pinafore”, we became mutually interested in this curious garment. As odd as a pinafore might look, it’s really so versatile and practical. Just think, a pinafore’s generous pockets serve as mini purses attached to ones clothes. Its frilly personality makes it fun, fresh, and pretty. Its multi-purpose “sundress-apron-jumper” design makes it something for mostly any season with the right fabric. An assortment of trimmings and even a wild or quaintly cute print only makes the pinafore look better. No really, this garment is meant to be there when you want to get things done and not worry about what to wear, like an old friend helping you out in your need. And if you sew your own, it provides an opportunity to successfully use up things from your fabric and notions stash. 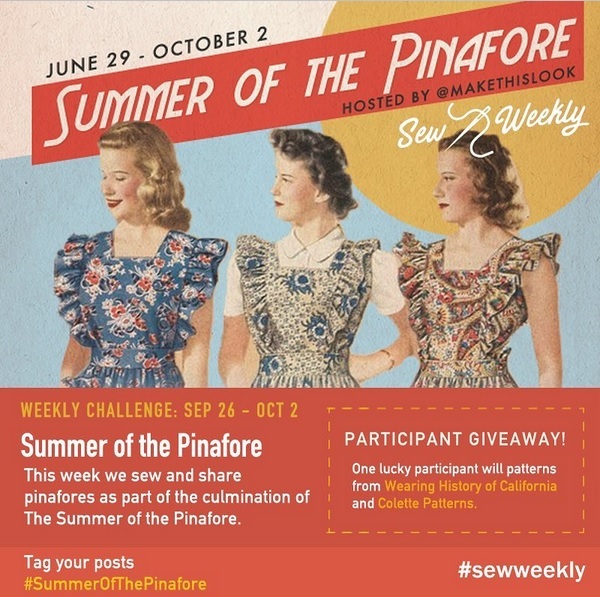 The “Summer of the Pinafore” is in its last week now (it ends at the first week of October) but I wanted to share some inspiration and knowledge to perhaps help others be motivated to join with me, to sew, or at least wear more pinafores outside of the sew-along. So firstly – what exactly is a pinafore, after all? A broad definition is that it is a collarless, sleeveless garment that implies an apron. A pinafore is often (not always) tied or buttoned in the back, and may be a simple apron or a full sundress-like jumper for wearing over clothes. This broadness and changing use of purpose for such a garment leads to much of the confusion as to what is a pinafore, after all…if you really want to “pin” down the term. What doesn’t help clear things up is the added language differences for the same thing as well as nicknames – “pinny” (colloquial term), “training tabard” (for children), “smock” (full bodice), “jumper” (sweater top in British English), or the plain old “apron”. The term “pinafore” certainly should be on a list of quirky and interesting sewing and garment related terms. To go with a technical explanation, the very name of this garment reflects how the pinafore was worn. The original pinafores had no buttons and were simply “pinned” onto the front, “afore” the body, which led to the conjunction “pinafore”. The last few centuries have seen this staple in the history of garment wearing evolve in use, shape, and purpose. Over the next few posts, I will add to this discussion when I share my two vintage pinafores which I made. Pinafores are a quaint, sensible yet embellished article of clothing which has stood the test of time, and deserve to make a comeback in some form or fashion. Yet, just because they are vintage does not mean they cannot still find their appeal today either! My next “convertible” creation will hopefully demonstrate that – stay tuned! 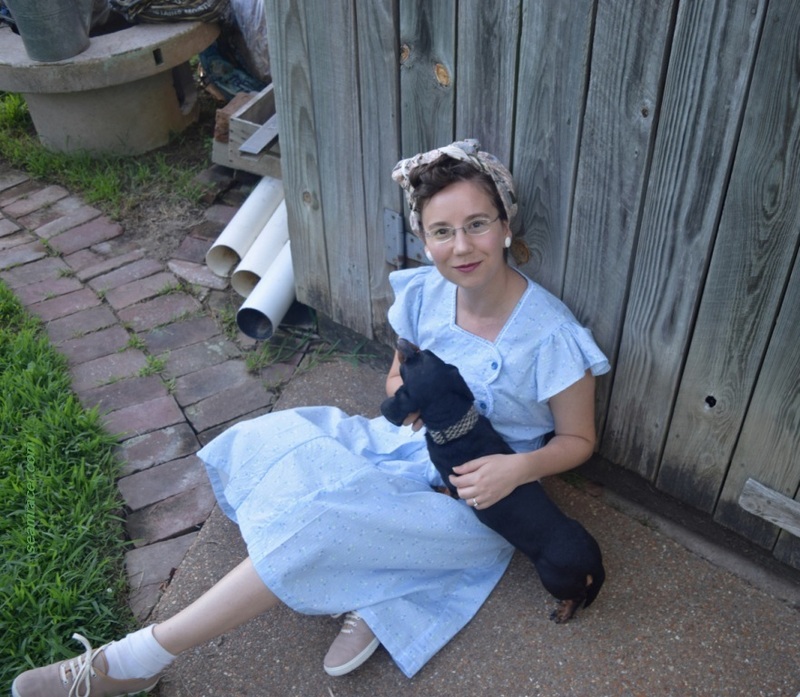 This entry was posted in Uncategorized and tagged "Summer of the Pinafore", "vintage sew along", 1940's, 1940s pinafore, definition of a pinafore, pinafore, sewing, vintage, vintage pinafore by kellycb. Bookmark the permalink. ugh, these are SUCH gorgeous outfits!!! 🙂 Can’t wait to see more! !